The following is the fourth in a series of posts covering Shormann Mathematics, Algebra 1, the newest product from DIVE Math and Science! Click here to read the complete document that covers Shormann Math core ideas, course description, and Algebra 1 table of contents. What does Leonardo DaVinci’s famous painting, “The Last Supper”, have to do with geometry? Use Shormann Mathematics and find out! History helps connect students to their world and their Creator. Most modern mathematics curricula ignore math history. But core ideas have consequences, and studying history often reveals which ideas are worth repeating and which ones aren’t. Did you know that Isaac Newton, author of the most famous science book ever written (The Principia), based the format of his book off of Euclid’s Elements, the most famous math book ever written? Did you know Shormann Math bases its format off Euclid’s and Newton’s famous works, stating rules and definitions up front, and using these as the building blocks to learn new concepts? Did you know that modern mathematics has a rich Christian heritage? Well, if you use Shormann Math, you will learn all about these things and more! Whether or not you are using a classical, trivium/quadrivium approach to your child’s education, understanding mathematics within a biblical, historical framework will help students make more sense out of what they are learning and why they are learning it. Screenshot of a part of Lesson 9 from Shormann Mathematics, Algebra 1. Did you know there is a connection between the U.S. 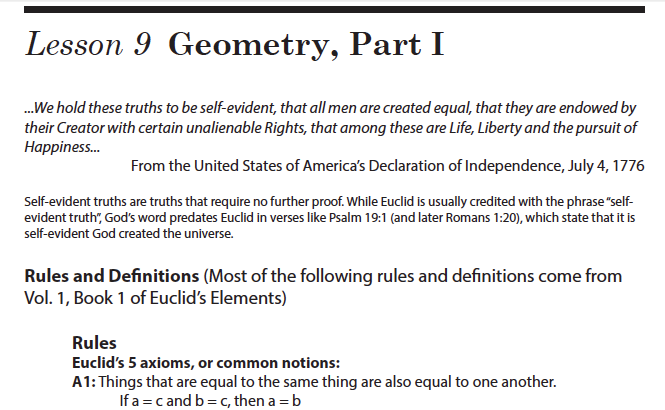 Declaration of Independence and Euclid’s famous geometry text, “The Elements?” Did you know Scripture predates Euclid’s main idea of “self-evident truths?” Shormann Mathematics uses history to connect students to their world and their Creator.